Richard Bauckham offers a fresh approach to the relationship between humanity and creation and our responsibility before God to steward wisely. The Bible offers fresh and often innovative approaches to a wide range of the issues that arise in relating the Bible and Christian theology to the ecological concerns of our contemporary world. Anyone concerned with a greener world. - Publisher The volume offers fresh, often innovative approaches to a wide range of the issues that arise in relating the Bible and Christian theology to the ecological concerns of our contemporary world. It aims to show that the Bible has far more of relevance to say on the subject than is commonly supposed. While focusing especially on biblical material, it also engages Francis of Assisi, modern nature poetry, Matthew Fox and the history of interpretation. 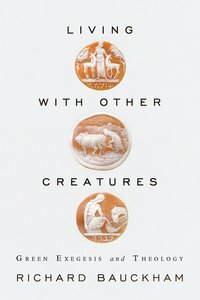 About "Living With Other Creatures"
The volume offers fresh, often innovative approaches to a wide range of the issues that arise in relating the Bible and Christian theology to the ecological concerns of our contemporary world. It aims to show that the Bible has far more of relevance to say on the subject than is commonly supposed. While focusing especially on biblical material, it also engages Francis of Assisi, modern nature poetry, Matthew Fox and the history of interpretation. Professor Richard Bauckham (Ph.D. Cambridge; D.D, F.B.A, F.R.S.E.,) is Senior Scholar at Ridley Hall, Cambridge, he was professor of New Testament studies and Bishop Wardlaw Professor at the University of St. Andrews, Scotland. He is a fellow of both the British Academy and the Royal Society of Edinburgh. Prof. Bauckham has published widely in theology, historical theology and New Testament. He is currently working on New Testament Christology and the Gospel of John.